Would you buy a house near a wind farm? Vote today! A new report confirms what we all knew anecdotally, which is that house prices fall within sight of wind farms. If you would like, you can download the full LSE report here: Gone with the Wind: Valuing the Visual Impacts of Wind Turbines through House Prices by Stephen Gibbons. 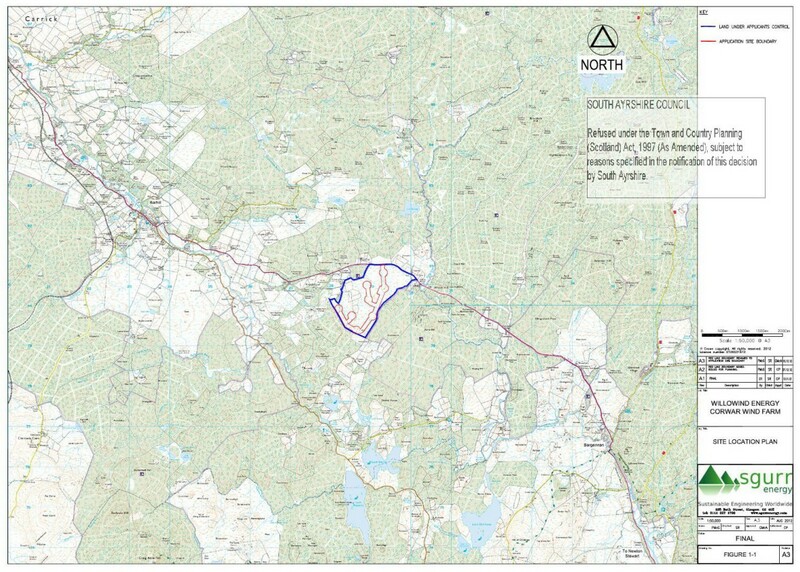 As if recent proposals near Loch Doon weren’t bad enough we regret to note that SSE are hoping to extend their wind farm at Hadyard Hill, near Barr by a whopping 51 turbines with a height of 126.5m. These would join the existing 52 turbines making a total of 103 turbines in yet another particularly scenic part of South West Scotland. They are holding two exhibitions; the first is on Tuesday 29th April, 3pm – 8pm in the Community Centre, Dailly, the second is on Wednesday 30th April, 3pm – 8pm in Barr Community Hall. If you can manage to go along and let SSE know how you feel about their plans to extend the wind farm then please do so. The extension would be north eastwards, towards Crosshill and Straiton and crosses over the minor road between Straiton/Crosshill and Barr. Click on the maps to see a larger version with more detail. To read the Scoping Report (5.3mb) click here. Just to keep you updated on what the developers have curiously called “Knockower Community Windfarm”, and in case you were wondering why you had never heard of the vibrant community of Knockower in Dumfries and Galloway. Knockower is a hill. A rather beautiful wild hill, just next to Coran of Portmark. We hope that the proposal doesn’t get any further, but if it does, we look forward to attending community meetings there, as the views will be great, but hope it won’t be too cold. Below the photos, we have put in the map, just to remind you – and yes, the proposed turbines are all over Knockower, and up onto the slopes of Coran of Portmark. The nearest actual communities to Knockower are Carsphairn (3.7km) and Dalmellington (10.5km), who already have plenty of proposed windfarms on their doorsteps, and probably don’t need any more educational visits just at the moment. “DAVIDSTOW COMMUNITY WINDFARM” – PLEASE NOTE DAVIDSTOW COMMUNITY WINDFARMS is not a local community project. It is run solely by Community Windpower Ltd, a profit-making business. The ‘project’ has no connection with any group or individual in Davidstow. See the Davidstow disclaimer here. Community Windpower ltd. is registered at Godscroft House, Godscroft Lane Frodsham, Warrington, Cheshire, WA6 6XU. It has two directors: Mr Roderick Michael Haydn Wood, and Mrs Diane Ailsa Wood. development. This landscape type is highly visible and well used for recreation. It would have a High visual sensitivity to larger development typologies. The presence of a Regional Scenic Area, a Wildland Search Area and the Galloway Forest Park increases sensitivity to larger typologies to High in terms of landscape values.” It concludes that “There is no scope for larger typologies and the small-medium typology to be sited within this character type without incurring significant impacts on a number of key characteristics.” Well, we couldn’t put it better. You can download the D&G Wind Farm Landscape Capacity Study here. 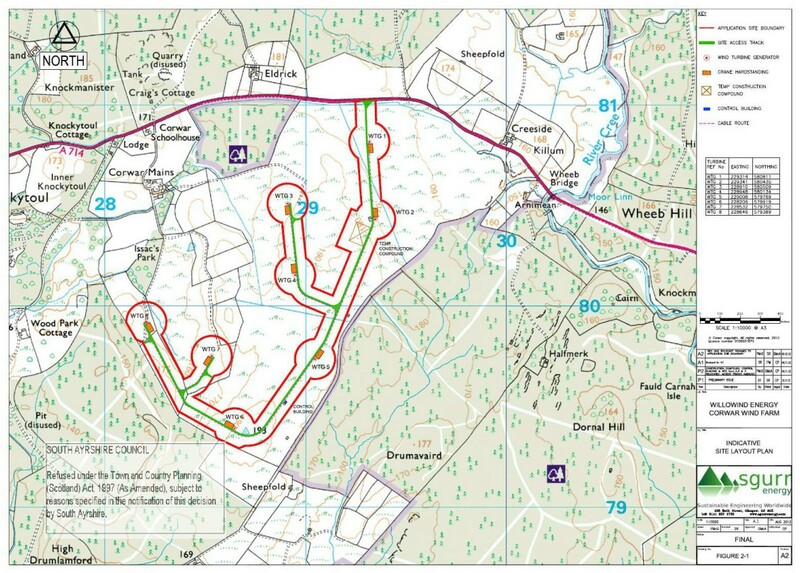 This map is from the scoping proposals for Knockower Wind farm (see our post earlier today). It shows the wind farms which are currently operational or in various stages of planning or scoping in Southwest Scotland. Click on the map and you will see it in a more detailed PDF format. 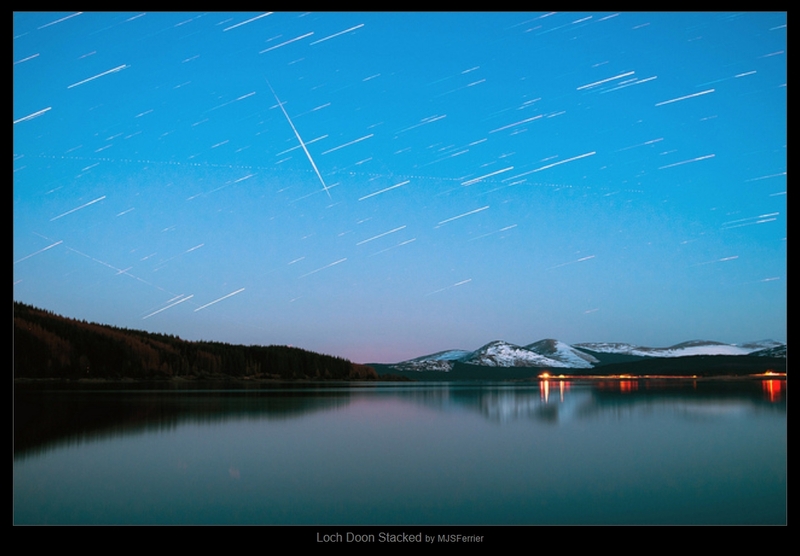 Knockower Wind Farm (16 turbines, at a huge 145 metres, totalling 48MW) has recently been proposed by Community Windpower Ltd for the eastern shores of Loch Doon. It is in the scoping stage (i.e. they haven’t yet applied for planning permission). If and when they do apply for permission, it will be to Dumfries and Galloway Council in the first instance. Community Windpower Ltd (CWL) was formed in 2001 and is an independent UK company. They have four operational wind farms; Dalry in North Ayrshire (18 MW), Aikengall in East Lothian (48 MW), Millour Hill (18 MW) (extension to Dalry) and Calder Water in South Lanarkshire (39 MW). They have planning permission for three more, which will increase their portfolio to 286 MW of wind energy projects. Although the word “community” features very large in their documentation, they are a profit-making renewables company whose proposals for “community benefit” are not radically different from those of any of the other major players in the renewables industry. As yet they have no particular proposals for the community benefits which will accrue from Knockower, other than that they will be “offering educational presentations throughout the design, construction and operational phases of the proposed development. These educational presentations will also be made available to other community groups in the area such as after school clubs, and local adult groups.” So that’s alright then. Press Release: Corwar Wind Farm Appeal Dismissed. 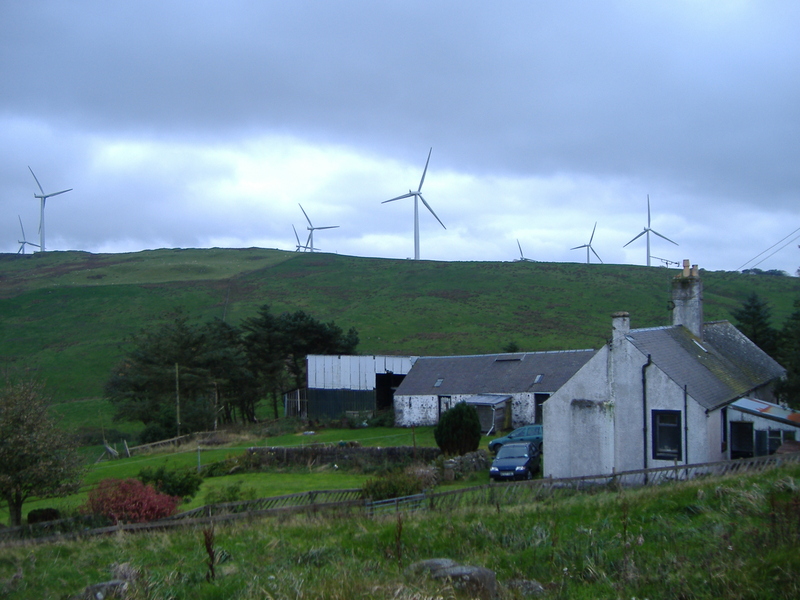 Willowind Energy Ltd was informed on 19th February 2014 that an appeal against the decision of South Ayrshire Council to refuse planning consent for an 8 turbine scheme for Corwar Wind Farm with a total site capacity of 16.4MW, was dismissed by Michael J P Cunliffe, a Reporter appointed by the Scottish Ministers. The Reporter concluded that the scheme would have significant adverse impacts which would outweigh its benefits, and that it would not accord with the development plan as a whole. He decided that were no material considerations which would in his view justify granting planning permission in the face of that conclusion. A WilloWind Energy Ltd spokesperson said “We are extremely disappointed at the Reporter’s decision as we believed that we had very strong grounds for appeal. Intensive investigation and analysis is undertaken to identify appropriate sites for all our projects and we still consider this site to be an excellent location for the size of wind farm that we proposed.” An appeal against the refusal of planning permission by South Ayrshire Council on 29th August 2013 was submitted to Scottish Ministers on 27th November 2013.